ORDER YOUR XMAS TURKEY HERE!! Why order a Flower Farm turkey? We’re farmers and we rear all our own turkeys at Flower Farm so we are 100% confident that our traditional farming methods are the best and have been since the 1950’s. Our Supreme Wirral white and black turkeys are raised the old fashioned way in open Victorian barns with lots of fresh air and space. We know how important the festive gathering is and our growing number of families who return each year to indulge in our turkeys are a testimony to this. Each turkey is carefully prepared and checked before leaving the farm. Such is our confidence in your satisfaction that we offer a full money back guarantee! Q. What are your turkeys fed on? A. 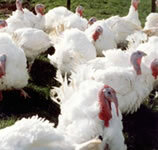 All our turkey feeds have been carefully selected using traditional, wholesome & raw materials. 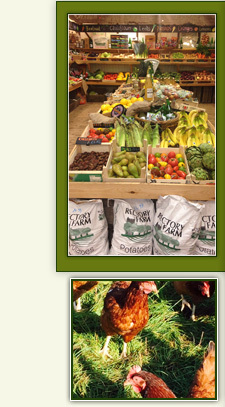 Wherever possible we use materials grown by British farmers. Q. What is kgs in lbs ? Q. How do I store my turkey ? A. Remove the turkey from the box and store in fridge ( or a suitably cold place , maybe a garage - but leave in the box ). Open the box as little as possible, but put the giblets, in their pack, in the fridge. Q. How long can it be kept before cooking? A. At 4 C ( a very cold fridge ) for 5 days. 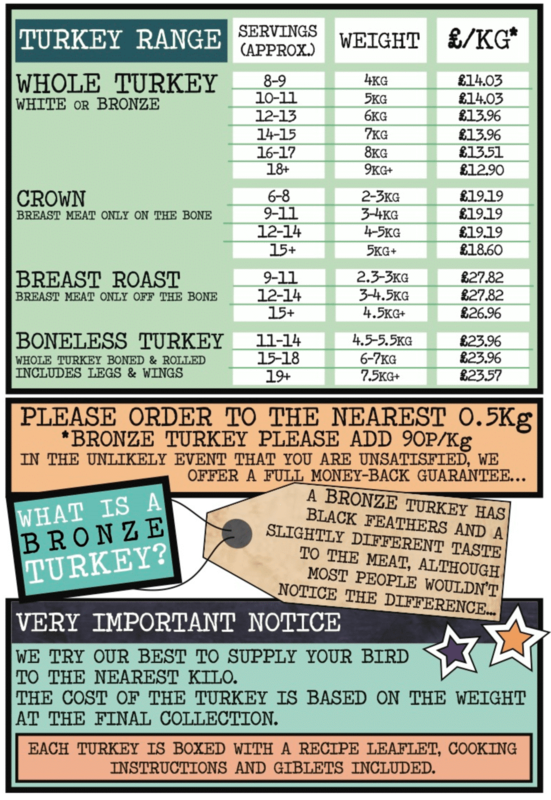 VERY IMPORTANT NOTICE - We endeavour to supply your bird to the nearest kg. The price is based on the final weight at point of purchase. 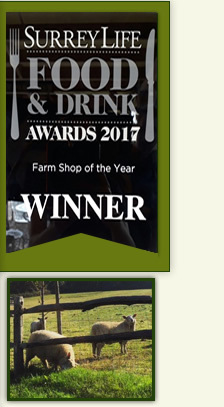 If you do not wish to reserve your Turkey online please visit the Farm Shop or phone on 01883 742288 to discuss your requirements . Please order early to avoid disappointment!